Cuisine: Contemporary seasonal Spanish tapas. Price: Medium (very reasonable for central London as both the quality of food and the portions you get are well above average). 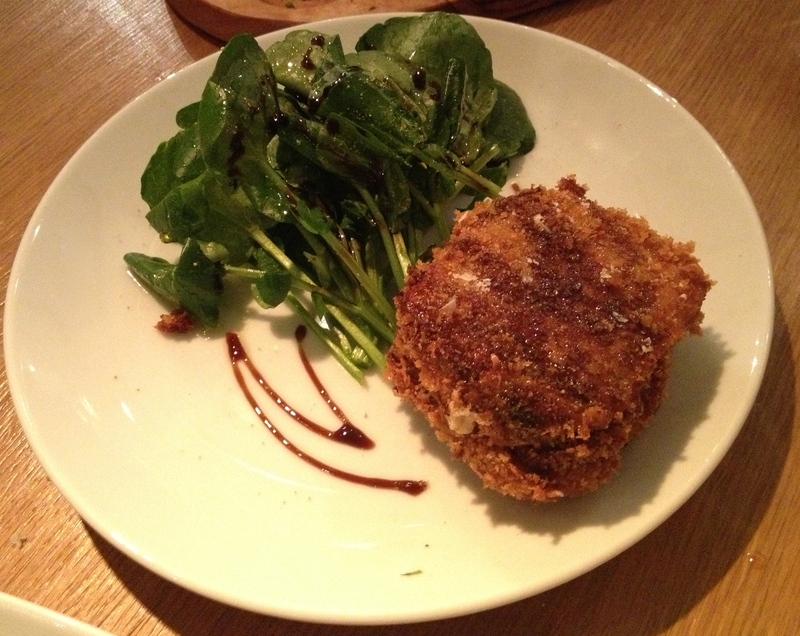 Food: Contemporary twist on traditional Spanish dishes. If you select from the classics such as the Jamón de bellota senorio (Bellota ham), ham and piquillo croquetas (deep-fried and battered potato balls with ham or not spicy sweet red peppers) Pimientos de padron (small green peppers fried and served sprinkled with crunchy salt) and sliced Manchego cheese (hard sheep cheese from Spain), you cannot go wrong. All these tapas are indeed very good and authentic. Choosing something perhaps less common for a Spanish tapas bar table might be interesting for those of you preferring innovative and less oily dishes in the style of the popular London-based chef José Pizarro. 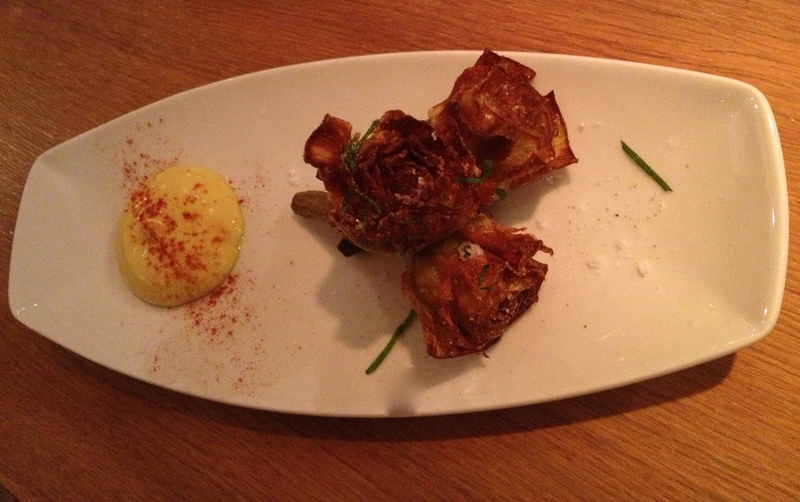 One such treat are the Crisp fried artichokes, that look like a lovely flower decoration, but taste like real artichokes. Fried just enough, with no oil dripping from the crisp vegetables and the mayonnaise-based dip is rich yet spicy with some hot paprika powder sprinkled over it. 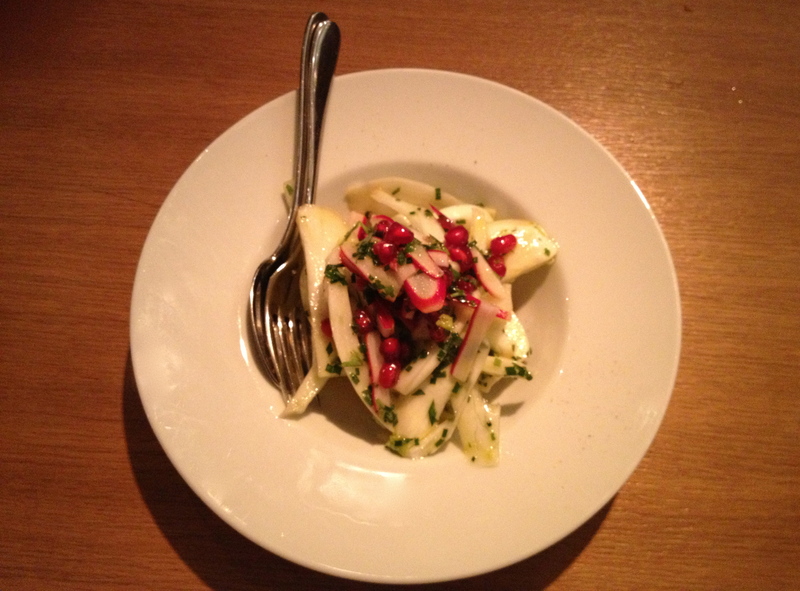 Another, more refreshing contemporary tapas is the Fennel, radish & pomegranate salad. It is so crisp and zesty that it reminds me of spring and sitting on the beach by breezy see. Lovely salad that can freshen up your palate between the fatty meaty, fried and cheese dominated spanish dishes. With wine the bruschetta-style toasted bread goes very well. The Pan con tomate is great with young red wines or refreshing white Verdejos. It is rather a big slice of bread and not a tiny piece of baguette, so be ready for a proper sized plate. 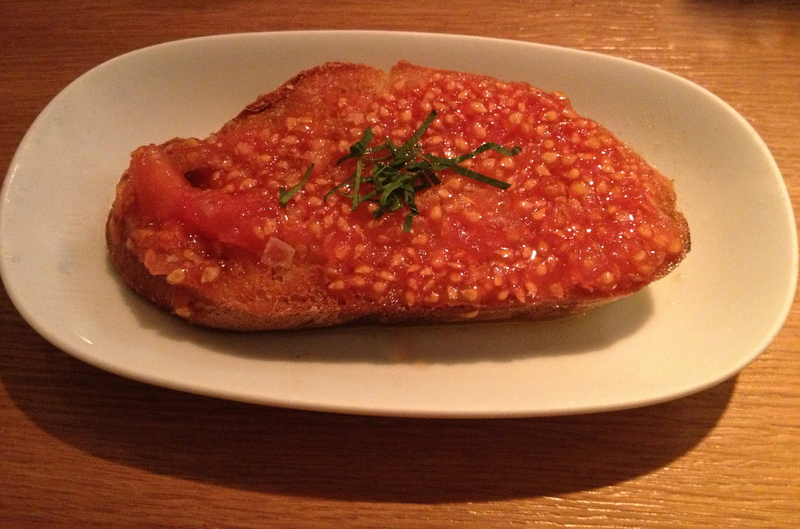 The juicy tomatoes spread over the crunchy bread balance the dryness of the toasting process. From the seafood the grilled Octopus & capers served on a wooden tray is very good, although a larger portion than is common for a tapa. The multiple pieces of baby octopus were tender, not chewy and spiced just right. The deep-fried Fino sandwich is as its name suggests the signature dish of Fino so we had to try it. The name of the sandwich is also a bit deceiving, but you have to try it. I will not tell you what it is all about, but picture below can give you a hint. Just come to Fino and try it for yourself, it is quite interesting and if you like something crunchy and are not a vegetarian you will probably like it a lot. Drinks: The mostly Spanish wine list is very good. Depending on how deep into your pocket you have, select one of the the top ranked Ribera del Dueros (such as the Vega Sicilia Unico), the middle-of-the-road Priorats or one of the more affordable Riojas. Red wine is in general a better choice because of the richness of the food, nevertheless a crisp Verdejo or deep Godello for an aperitif is a great start and both will surely go well with the seafood dishes. We went for one of the newer wines of the Alvarez family, of the Vega Sicilia fame. 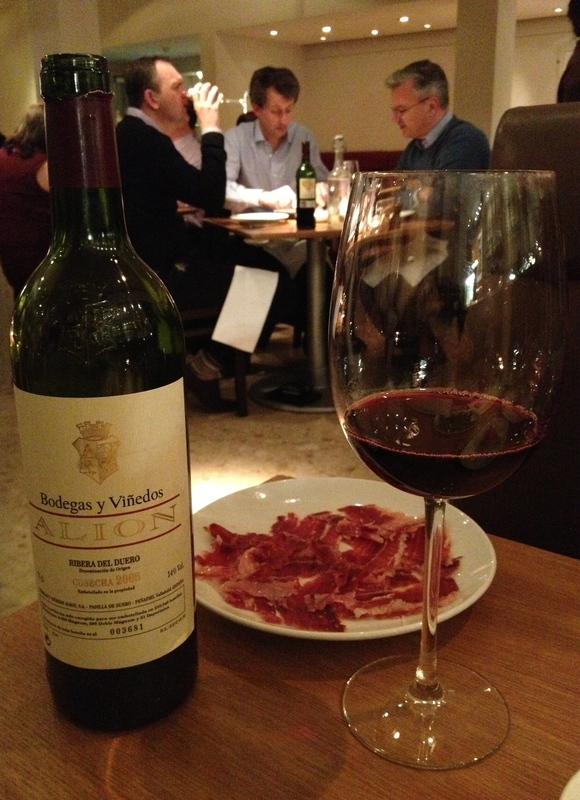 Their Alión Cosecha 2006 is deep and structured Tempranillo expressing in its concentration the dry climate of the Duero area. Complex wine with very long finish that calls for intense dishes to match. 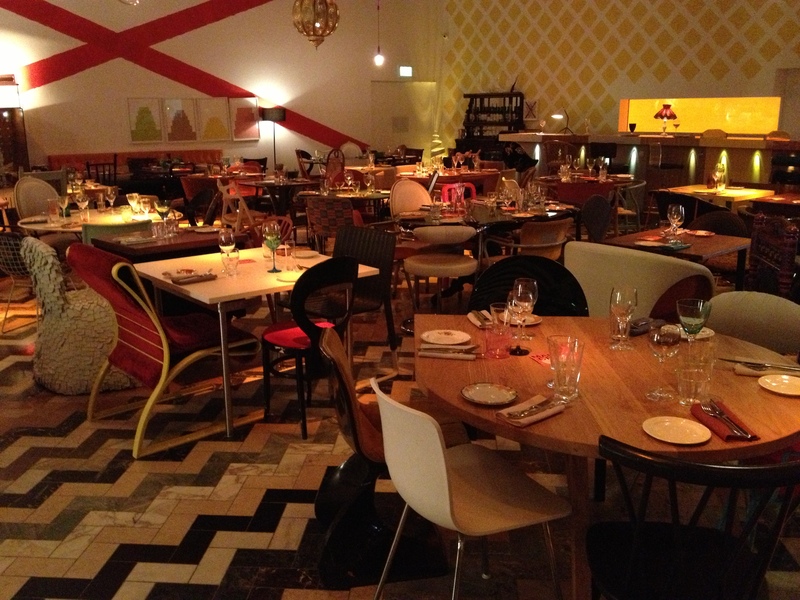 Atmosphere: Modern, fresh, fun and vibrant. There are many people coming straight after work, so you will see some ties there, but overall you can wear something casual. Comfort lovers will love the cosy booths, bar fans appreciate a corner bar area with views of the restaurant, curious minds will surely often peak into the open kitchen and exciting interiors seeking crowd will be amused with interesting decorative finishes. It is a great place to go with friends, business partners not relishing overtly pretentious gastronomic restaurants or bringing there a first date since it does not feel too intimate. Opening hours: Mon-Fri 12:00–2:15 pm, 6:00–10:15 pm, Sat:6:00pm-10:15pm , Sunday: Closed. Cuisine: Greek modern tapas style. 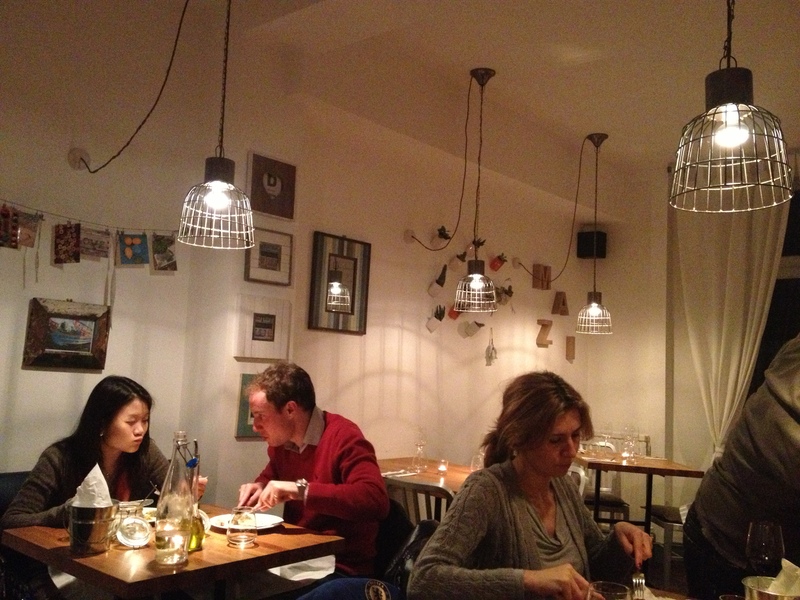 Atmosphere: Cosy, fresh, friendly and vibrant. This small dining spot in the heart of Notting hill is casual and unpretentious. As you enter you will see a selection of Greek specialities available for purchase so if you want to prepare some dish at home, you get the ingredients right here. There is a tiny dining area just at the entrance, and a bigger one after you pass an arched door with a sign “Life is beautiful” suggesting that Mazi’s owners enjoy what they are doing. Wear jeans or shorts and you will feel fine, there are no rules here in terms of clothing. Food: Traditional Greek dishes reinterpreted to modern world with aesthetically appealing presentation. Owing to its name, Mazi means “together” in Greek, the food is designed to be shared on one table with your friends, family, partner or anyone you feel comfortable with. Mazi has received lots of attention from the press so far and its innovative approach is celebrated by many distinguished palates, nevertheless my experience was not as overwhelmingly exciting. The food was nice and interesting, but I cannot say I would put into my Top 20 restaurants to dine at in London. To start with, one should go for one of the “Jars”. We tried the Kolokithopita, broken filo pastry, feta and mint and Beetroot, goat cheese and grape reduction, both original but not appealing to my palate. The ingredients are mixed together and presented to you in a glass jar from which you can serve the dish on a plate. I much preferred the warm dishes such as the small Tiger Prawns “Saganaki”, Ouzo and smoked Metsovone. The prawns were grilled in the Greek speciality spirit called Ouzo and were intensely fragrant and tender. Another tasty nibble to share was the Feta Tempura with lemon marmalade and caper meringue. The fried cheese slightly creamy, but rather on the drier side, enveloped in a fried batter and served with sweet and sour condiments, perfect to flush with a glass of crisp and aromatic white wine such as the Greek Semillon we had. My favourite dish was the Lobster with Orzo Pasta, lemon and dill (picture above), which is the most expensive dish on the menu, yet really seemed to be the most balanced and tasty. 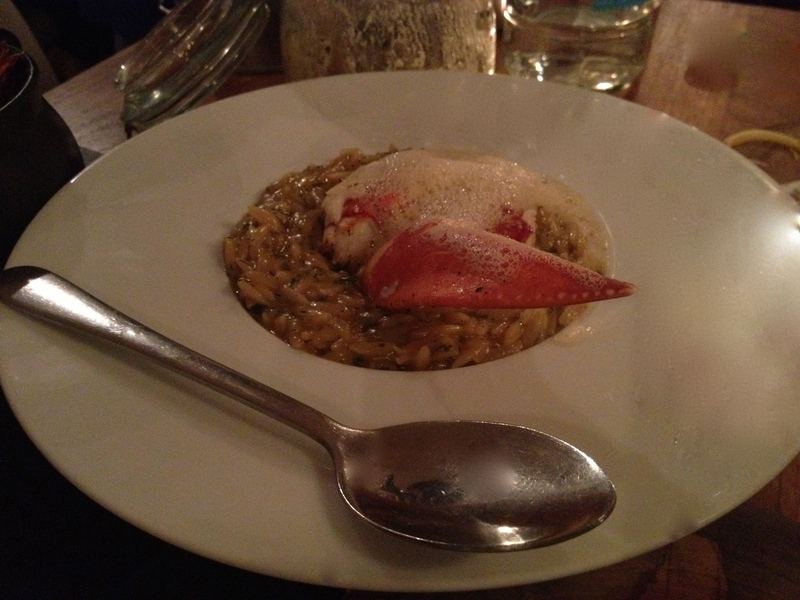 The orzo pasta in the shape of a large rice grain had a delicately chewy texture combined with the tender lobster and aromatic lemon foam were superb. 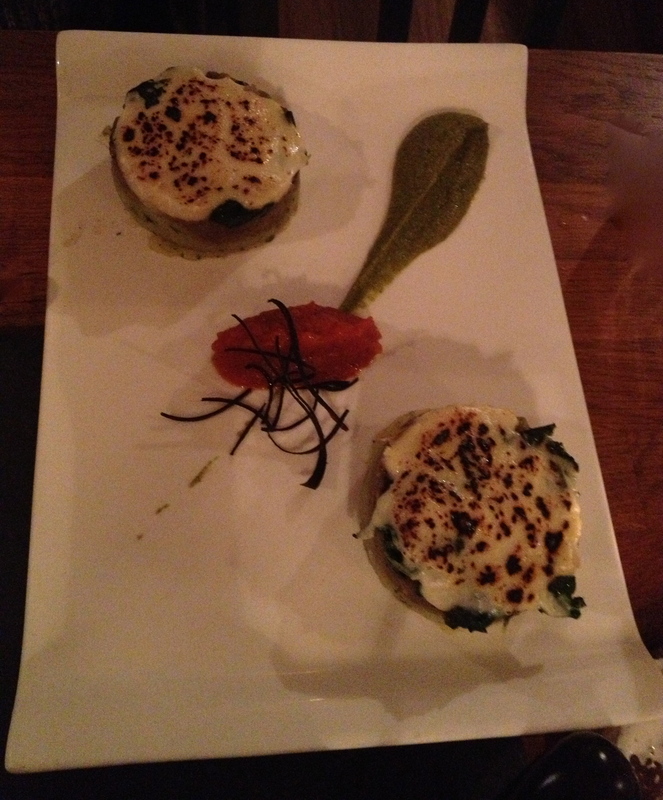 From the vegetarian selection I would highly recommend the Spinach Mousaka with Basil and Courgette purée. It was all about the melting cheese and the refreshing power of the basil and courgette purées, when all mixed together tasting like a roller coaster of vegetal flavours. It has some oil in it, but not as much as in traditional moussaka. Drinks: Mazi has a great purely Greek wine list (with an exception of sparkling wines) with very reasonably priced wines. It is an excellent opportunity for the adventurous wine drinkers to explore the fruits of this ancient wine-producing country. It was in Greece where the philosophers once pondered over breakthrough ideas while sipping on a glass or a jar of wine. 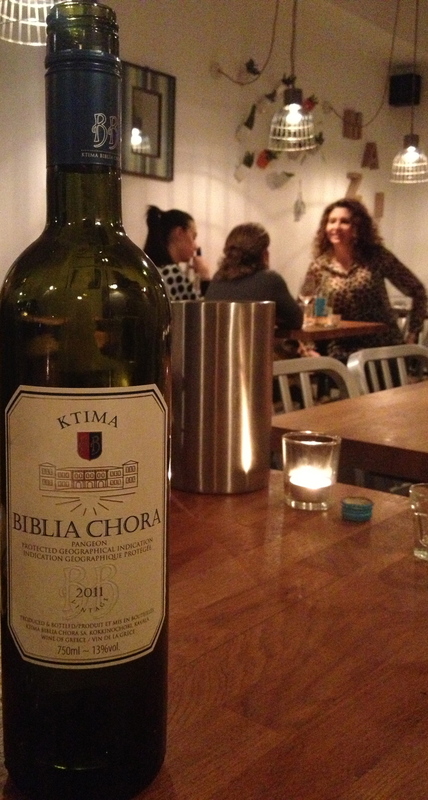 We went for the fresh, yet quite deep (short barrel ageing) and easy to drink Biblia Chora Ovilos Barrel, Semillon, 2011. Although on the more pricy side of the list, for £58 per bottle it was much less than at most fancy restaurants in London. Otherwise the wines start at £23. The Semillon was rather different from the oily character and burn-toast Semillons from Bordeaux (blended with Sauvignon Blanc in Pessac Leognan and used for the famous sweet wines from Sauternes) as its Greek version has somehow kept more freshness despite its generally low acidity. Not in mood for alcohol? Then perhaps the Wild rose, Fresh mint or Greek Mountain pot of tea will warm up your spirit. The Wild Rose in particular looking very appealing and exotic. On the other hand the Greek Mountain tea known also as Shepherd’s tea is very popular in Greece to alleviate colds, respiratory problems, improve digestion, strengthen the immune system, and also it is a great source of anti-oxidants. It is also used as an anti-inflammatory to reduce fever and pain. Visit: April 2013 (Since Sketch opened in 2002 I have dined there on a number of occasions, yet it is the forefront Parlour where I found my inner gourmet soul. The gastronomic restaurant still remains an interesting place to have a dinner and the Gallery is a fun room with great food while listening to the newest tunes of world music). Price: High to very expensive at the gastronomic restaurant. Chef : The head chef Pierre Gagnaire, who is behind the menus across Sketch, is a twice awarded three Michelin star French gastronomic hero. He has spread his influence worldwide from his restaurants in Paris, London, Tokyo, Hong Kong, Seoul and Dubai. At Sketch he influenced the executive chefs creating the food in all restaurants across Sketch. It is though at the Lecture Room & Library, Sketch’s two Michelin starred fine dining restaurant, that his influence comes to life most vividly. Atmosphere: The Parlour can transform from a breakfast venue, through comfort lunch and original afternoon tea until the last drink before heading to bed at home. After 6pm it turns into a cool bar scene here, while the afternoons are popular for the tea-to-tellers enjoying a cup of a warm beverage with a cake or sandwich. 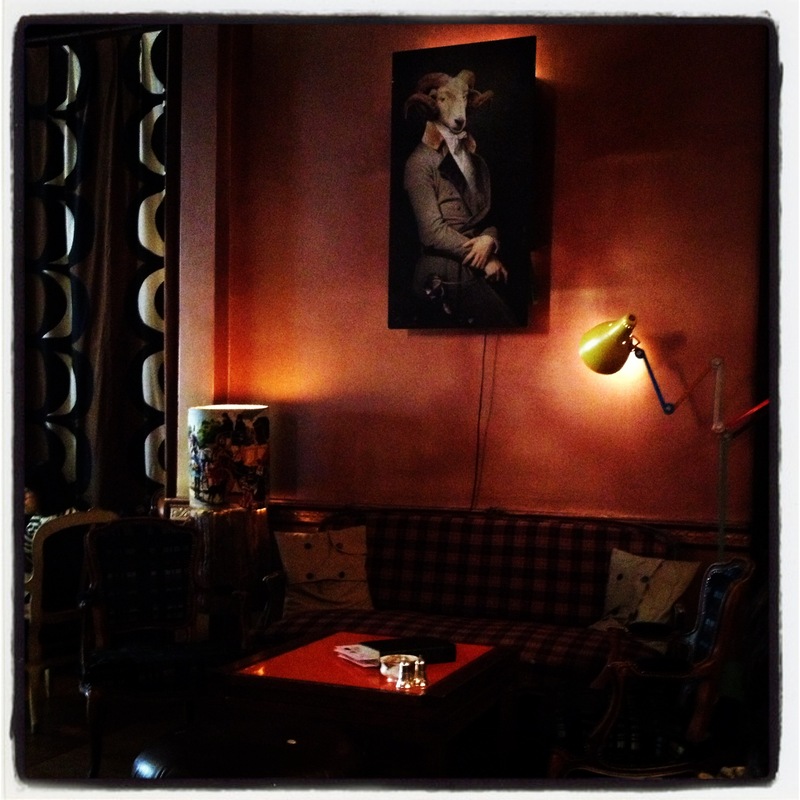 It is quirky, eclectic and warmly decorated. One can enjoy the same treats (except for breakfast), yet in a very different environment at The Glade (pictured below). The rather ‘foresty’ design of the room attracts the “natural” crowd with tendency to prefer organic produce and cotton t-shirts rather than leather jackets and fur coats. Rattan furniture, plant-based design and vibrant natural colours were created by the duo of artists Carolyn Quartermaine and Didier Mahieu. Food: With the exception of the gastronomic restaurant upstairs, the menus tend to intertwine so you will find some of the brasserie features at the Parlour and Gallery as well as at the Glade. One of these tasty dishes is the Artichoke salad. This starter of chopped baby artichokes, fennel with blue Stilton cheese, capped with fresh herb bouquet and baby salad leafs is refreshing a great with fresh green tea or a glass of white wine such as Sancerre. Another common feature is Pierre’s salad of beefsteak tomatoes, salad, chicken breast, anchovies, crunchy croûtons, Parmesan cheese and refreshing creamy horseradish dressing. For the Caesar salad style lovers this is the right choice. A healthful cup of Green soup blended from watercress, spinach, cucumber, green apple and a dollop of cream will please vegetarians and nutrition conscious diners. On the other hand the more hearty Beef tartare served with potato “fondant” is perfectly tender (hopefully no horse meat in it, but I doubt it as it would not taste so smooth like this) and presented lovely with a shell of tiny quail egg with slightly running yolk in a mollet style. Sandwiches, Mac and cheese, burgers and afternoon tea specialties such as daily made macaroons, scones, signature cakes with apt names such as “London to Paris”, King of Sketch” or a very French “Gâteau Chocolat” (the later being a chocolate sponge cake with mousse and passion fruit ganache) as well as finger sandwiches are great options too. 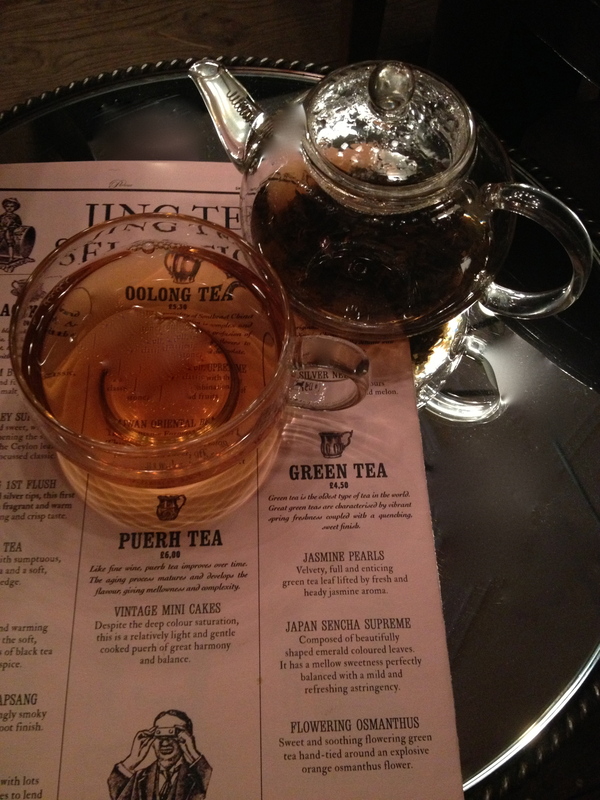 Drinks: From rare coffee, herbal infusions to Jing tea selection of real teas from green to black pu-erh, one can get plenty of energy and youthful antioxidants for an entire day or an afternoon caffeine kick. On a quite chilly cold early spring day I felt like soothing my bouncy mood with a pot of earthy and balanced pu-erh from China. Its is a speciality from Yunan province that is usually kept and sold in the form of cakes (the tea leaves are rigidly dry and stick together in the form of this cake or a bird’s nest that is actually baked to keep its longevity). Presented in a transparent pot and cup it was pretty, yet I did not have the opportunity to separate the steeped leaves from the water thus the tea got bitter over time. As I do not like to sip my tea too fast , I ended up with a bitter aftertaste after my last sips. The wine list is done with a wit. I love the drawings above each wine with ties, scarves bows and other possible tops of shirts that a man can have, that probably had stirred the author’s imagination while he was sipping on each wine and drawing each representative of its taste above. The selection is good, yet the gastronomic restaurant above has much wider list that has got the Award of Excellence from WS. 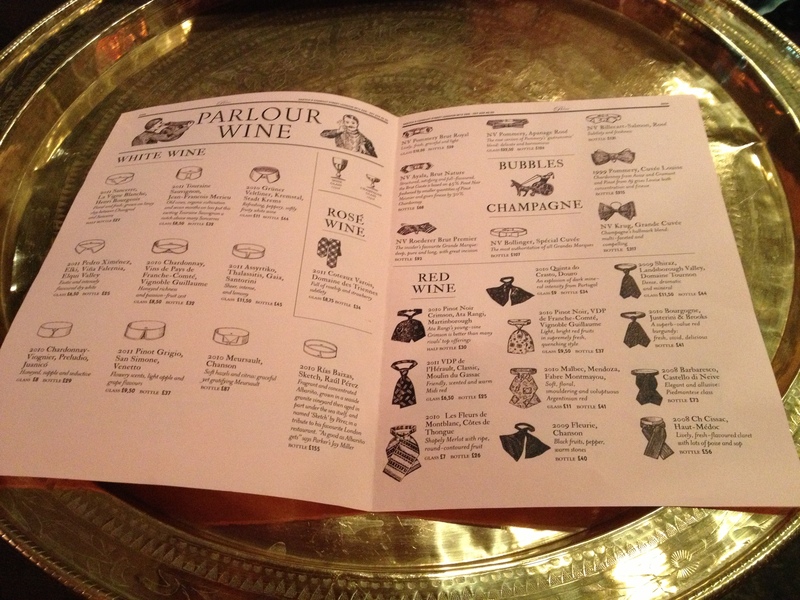 The Parlour: Mon-Fri: 8am – 2am, Sat: 10am – 2am & Sun: 10am – 12am. The Glade: Mon-Thurs: 1pm-2am, Fri&Sat: 12pm-2am, Sun: 12pm-12am. The Gallery: Mon-Sat: 6.30pm – 2am, Sun: 6pm – 12am. Lecture Room & Library: Tues-Sat: Lunch: 12pm-2:30pm, Dinner: 7pm-11pm. 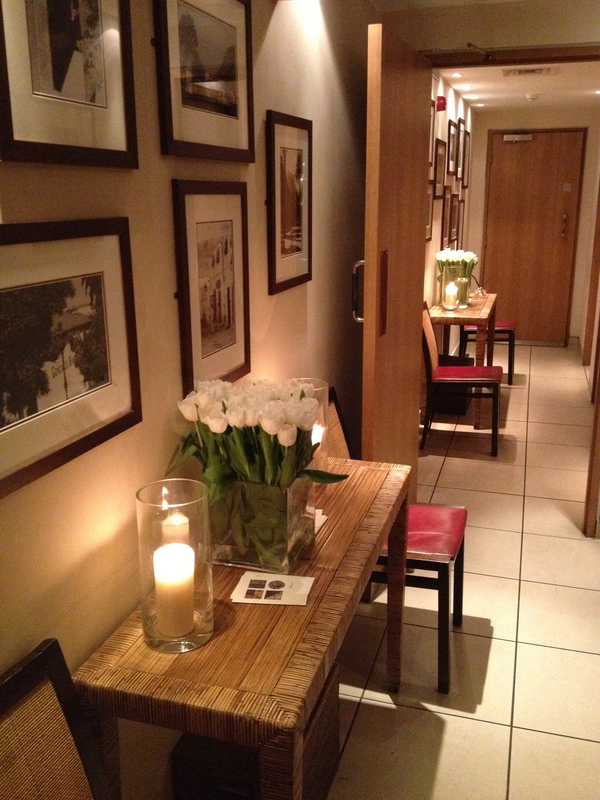 Address: 9 Conduit street, London W1S 2XG, UK. Price: High (but the quality of ingredients and complexity of the dishes compensates the price, an intimate atmosphere makes a dinner or lunch here a special occasion). Chef: Vineet Bhatia is the first Indian chef-restaurateur ever to receive a Michelin star at an Indian restaurant (London’s Zaika restaurant in 2001) for his “Indian gourmand experience“, and later another one in his own establishment Rasoi (meaning “kitchen“) in 2006. Thus he is the first Indian chef in the world to have two Michelin stars. 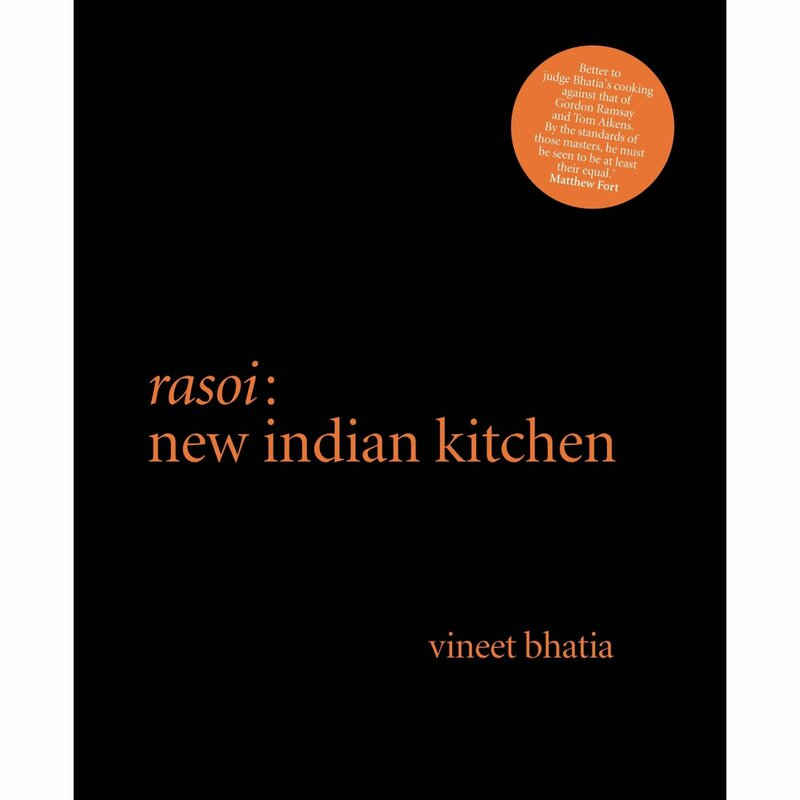 His childhood dream of becoming a pilot was not fulfilled, but his fascination with food and cooking together with an ” ambition and determination to prove myself” as he wrote in the foreword of his cookbook called simply “Rasoi: new indian kitchen“, made him one of the stars of Indian cuisine not only in his home country but worldwide (with restaurants in Geneva, Dubai, Doha, Mauritius, Moscow, Mumbai, …). After an amazing meal at Rasoi I had to purchase the chef’s book and cannot wait to follow his guidance to assemble some of the complex ingredients-rich yet balanced and light dishes I had. Food: Classical Indian dishes in a much lighter gourmet coat, which the chef calls “evolved Indian food“. As the chef reinvents and refines the Indian dishes so wonderfully that his cooking seduces the palates of even those so far deterred by the heavy, oily and rich curries, fill pastries (samosas) and creamy sauces. I have eaten all across India and I have never tasted anything more sublime than Bhatia’s cooking. 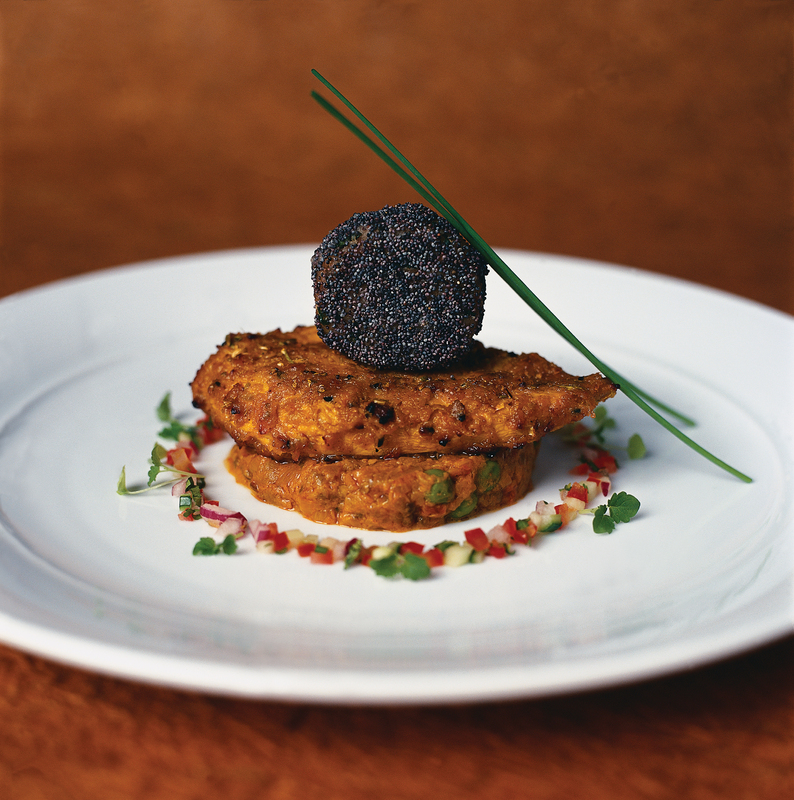 He is a true master of spices and elegance as he blends the flavours in a perfect harmony. 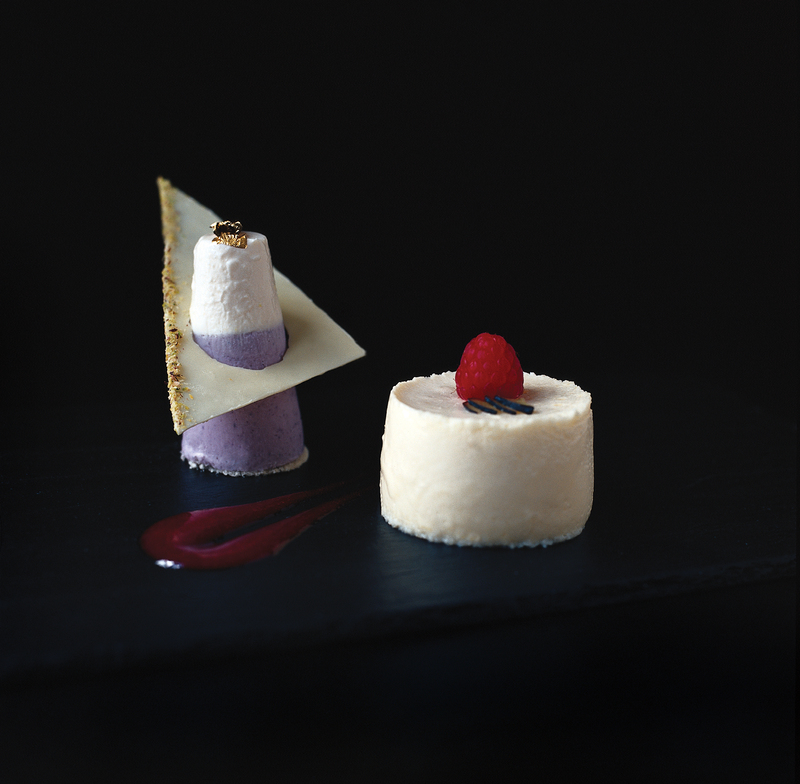 It is rare to have a tasting menu or try more than eight dishes at one restaurant and like every single of them! And, that is what happened at Rasoi. The naan and crispy roti breads as well as the trio of crunchy various vegetables filled samosas (fillo pastry in triangle shape) were freshly prepared, the dips generous yet not too rich or spicy and all the dishes intrigued our palates. I must elevate the Spiced Home-Smoked Salmon, red Onion, Cucumber and Dill Raita which charmed the palates of all four of us dining at the table. The salmon was so tender that one did not need to chew on it, jut let it melt with all the wonderfully integrated spices from the marinade. Smoking the fish added depth while adding yoghurt into the marinade calmed the smoky flavours just to perfection. The recipe is in the chef’s cookbook, so if you dare you can try it at home. The Stir-fried Chilli Paneer, Spinach with Potatoes and Pickle-flavoured Tomato Sauce was another superb creation. The paneer cheese is perhaps the most important dairy product used in Indian cuisine. Vegetarians come across the dishes peppered with paneer very often. 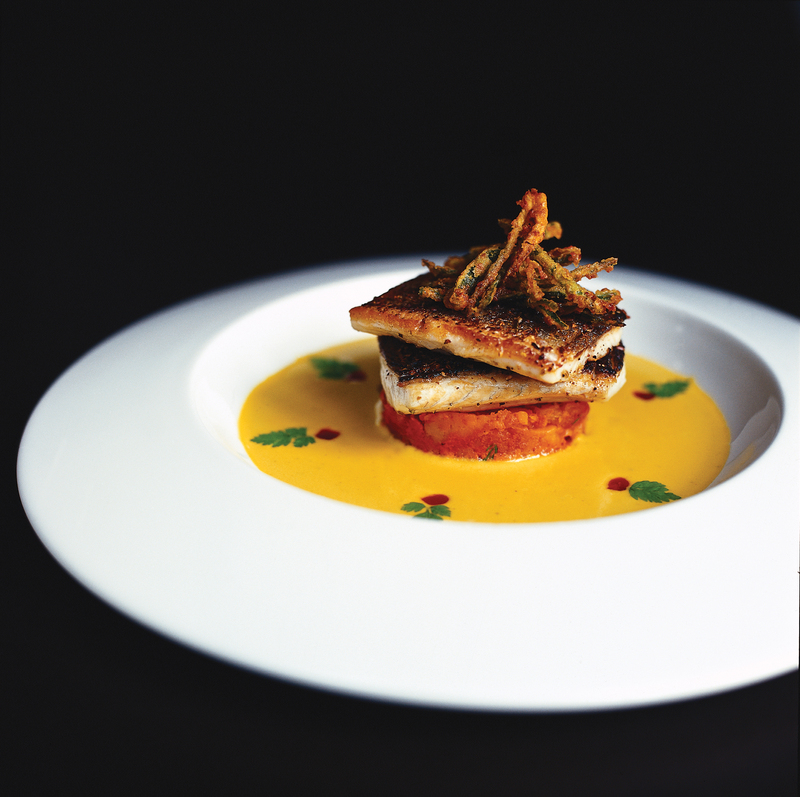 In Bhatia’s take it got a more gastronomic dimension and an eye-catching presentation as with most of his creations. The paneer was soft and spiced with mustard seeds, ginger, chilli, curry and fresh coriander and sever atop of the tasty spiced Spinach with potatoes and thick savoury Tomato Sauce. The trio of Chicken Tikkas was like a tasting contest in which each of us had a personal favourite. They were delicious all, tender and almost did not taste like chicken how well-integrated the marinades and sauces were. The Lamb ‘Shikampuri’ Skewers in a kebab-like fashion did not stand behind and we were so impressed by all the food that although we were all full we still managed to nibble on the pre-desserts brought together with the warming cups of sweet Chai tea served traditionally with milk. Atmosphere: Rasoi is located in a small townhouse in Chelsea just off the Sloan Square. If you did not have the address and were not going to the restaurant you would probably passed it without noticing it. There is a bell on the door, so you ring the bell, a suited person opens and invites you in. Turning right you pass a tiny bar area and walk through to the cosy restaurant room. With 13 tables spread across two small dining rooms and two private rooms upstairs it really feels like in someone’s house rather than at a restaurant inside. There is no music, no distractions, only authentic decoration in the truly Indian spirit that Rashima, the wife of the chef, created herself. Drinks: The wine list is impressive as it should be at a Michelin stared restaurant. The list of Bordeaux and Burgundy is particularly food-friendly that we went for the same bottle of red Burgundy twice. I would never have thought of drinking Burgundy with the spicy Indian food, yet Bhatia’s cuisine is more elegant and balanced than most of the super spicy and creamy Indian dishes you might know so it matches the elegant Burgundies. I was disappointed not see a wider tea selection considering India being one of the world’s biggest tea producers, yet the spicy-warm Chai Masala tea after the dinner soothed my tea cravings enough. Opening hours: Mon-Fri: Lunch: 12:00–2:30 pm; Dinner: 6:00–10:30 pm; Sat: Dinner: 6:00–10:30 pm; Sun: Closed. Address: 10 Lincoln Street, Chelsea, London SW3 2TS, UK. From Lima through LA, Buenos Aires to London, Peruvian cuisine became trendy over the past couple of years. My trip to Peru last year confirmed that this South American country has tremendous potential on the global culinary scene. With thousands of diverse ingredients this is the land of plenty that most creative chefs dream of exploring. It is one thing though to get a plate of potatoes or raw fish ceviche on a local market in Lima, and getting the same freshness and a more sellable look on the plates of distinguished diners with deep pockets in the world’s top cities. I have tried peruvian cuisine in many cities outside Peru in the past year and none had achieved, what the recently opened Coya in London’s Mayfair did – creating authentic, high-quality menu with the right level of experimental spirit. Atmosphere: It is dark, with a great vibe created by the almost night-clubby music/cocktail bar you have to pass right after descending into the underground of the secretive entrance in one of the buildings lining up along Picadilly and the nearby St James Park. The bar is fun and there are some tables you can reserve and have a bite with your pisco sour or some other cocktail from the seductive bar list. Currently it is quite hard to get reservation at the restaurant since it became the hottest place to eat at in the city, but if you do not mind eating late just come around 10pm and wait at the bar until a table frees up. At the restaurant you can sit along the ceviche bar behind which the chefs slice and dice some of the cold dishes. 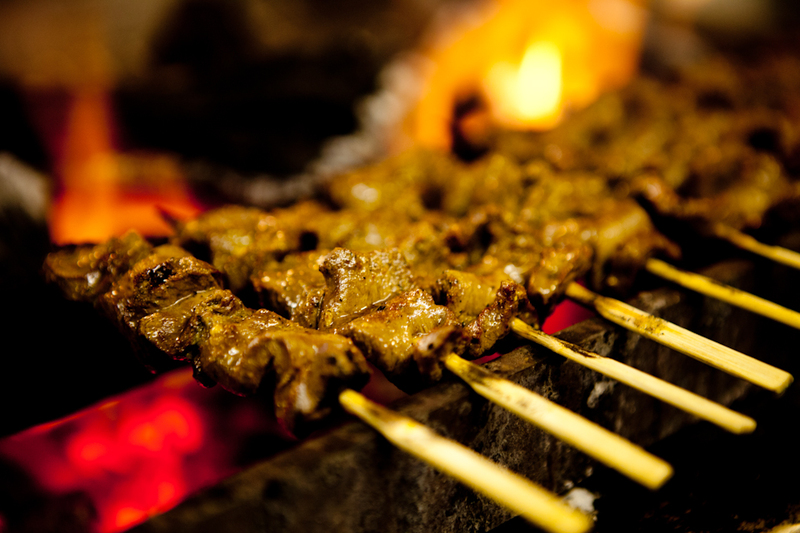 There is also Open Charcoal Grill where the warm meats and seafood are being prepared. This open-kitchen concept is not a novelty but increasingly the interior design choice of most of the new restaurants worldwide. Most diners seem to like the fact that the preparation of their dishes is open to scrutiny of the demanding customers and also it makes it more of an interesting dining experience rather just to stare at one’s plate and people around. At Coya the attentive, super-friendly effective yet casual waiting staff just perfectly rounds up the exciting atmosphere of the place. I was surprised how quickly most of the dishes arrived considering the fact that the restaurant was packed until late hours. Food: Authentic as well as innovative using mostly peruvian ingredients in new dishes. You must try one of the signature tiraditos (the Salmon is great) and ceviches from the starters. Ideally ask the staff as they advised us very well on which is the most popular as well as which of them might be better on that concrete day. The with the skin roasted potatoes Patatas Bravas with rich Huancaina (mayonnaise-based) sauce are naughty but really tasty and its heaviness almost disappears if you sip it with a bolder wine such as the full-bodied Argentinian Malbec, the tannic Tannat, the paprika-spicy Chilean Carmenére or for the adventurous of you (as we did) the powerful Petit Verdot. These wines go well with the meat dishes too. The juicy and fatty Spicy grilled beef fillet was tamed by the rich Petit Verdot from the Chilean producer Von Siebenthal. Do not miss the deserts as it is the sweet selection that shows the most innovation. From Corn Sundae, Lucuma Bavarois to Sweet Potato Ice Cream, you probably have never had none of these combinations. I am curious how many chefs are going to copy these recipes. 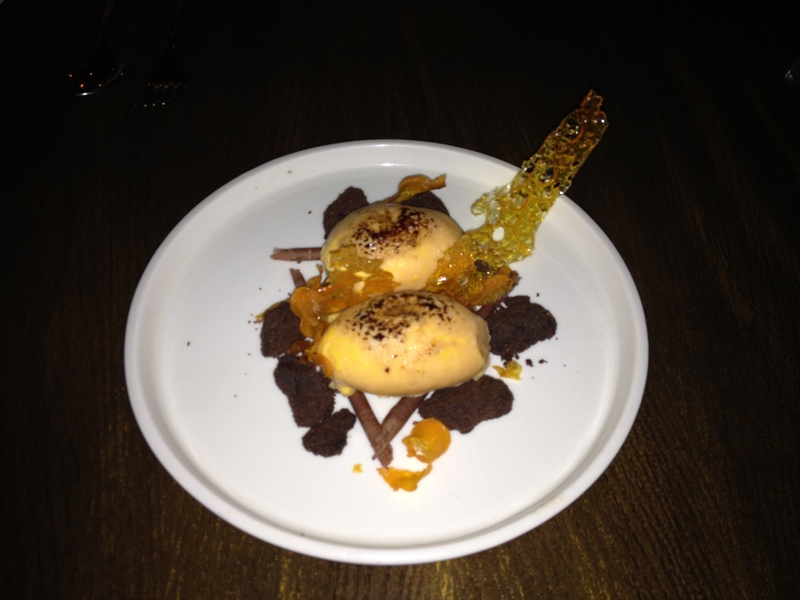 I have indulged in the Sweet Potato Ice Cream served on the side with Burnt Chocolate Crumble. The fact that Peru has over 3.000 types of potatoes and corn is unbelievable for most people, yet it stirs one’s interest in trying various dishes prepared from these two multifaceted ingredients. The Sweet Potato Ice Cream was deliciously creamy with tremendous depth underlined by the exotic spices, dried fruit and cocoa powder. Peru is also one of the major cocoa producers and I must admit I have a crush on the single origin chocolates from this country. The Burnt Chocolate Crumble was genuine, rather in a raw character where the cocoa stood out and other ingredients such as sugar or vanilla commonly used in chocolate bars and truffles were not overshadowing the beautiful richness of this antioxidant-rich delicacy. The current dessert menu offers many of the Peru’s super-foods such as Lucuma (Vitamin C rich fruit) or Quinoa (great gluten-free source of proteins) so it can make you feel less guilty about finishing your dinner with one of them. Drinks: We went for the adventurous 100% Petit Verdot from Vina Von Siebenthal in Chile’s Acocangua Valley. Petit Verdot is a very tannic and robust grape varietal usually used in a small volume in blends (red Bordeaux wines are the most famous). Yet as with most of grape varietals they show differently in a different terroir. Malbec and Tannat are both good examples. Malbec in Argentina is much more fruity and round than in France, the same applies to Tannat in Uruguay and Brazil where its harsh tannins are balanced by its juicy fruity character. Tannat in South-West French region of Cahors is rarely drinkable on its own and is blended. 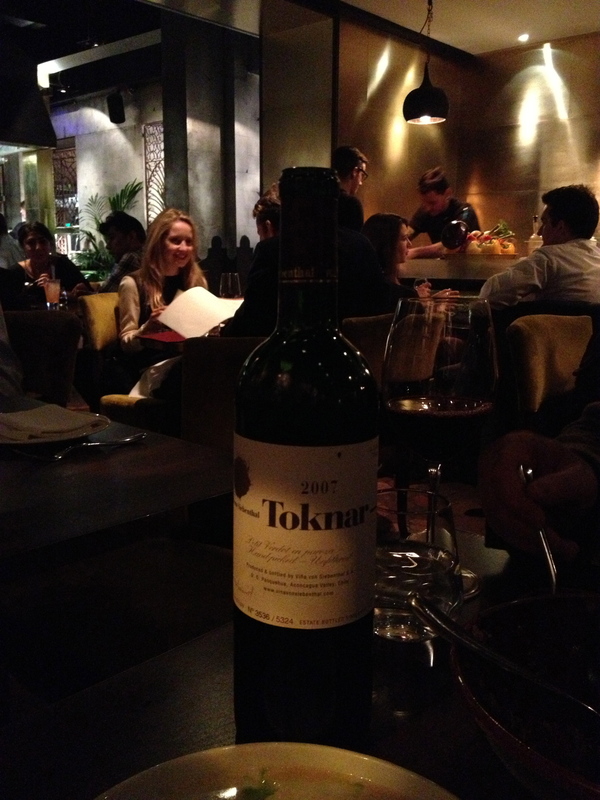 The Toknar 2007 from Chile has higher alcohol (14.5%on the bottle), but you could not detect it much on the palate. The depth expressing rich concentrated dark fruits with chocolate, caramel and nutmeg might be too much for some wine drinkers, although perhaps not for the Parker-like palates loving concentration. Fatty meal such as the grilled beef we had befriended this wine, yet the fish and seafood dishes were practically not possible to match. Pisco Sour is marvellous with ceviche as well as most of the tiraditos, so if you are starting with this grape-spirit-based cocktail save it for these fishy starters. 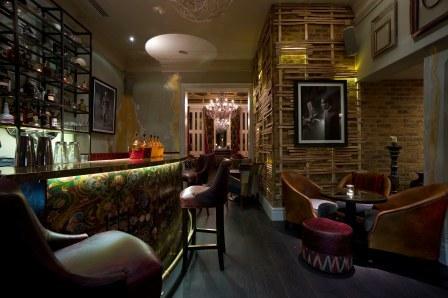 Pisco bar: Monday to Saturday 12:00 pm – 1:00 am. 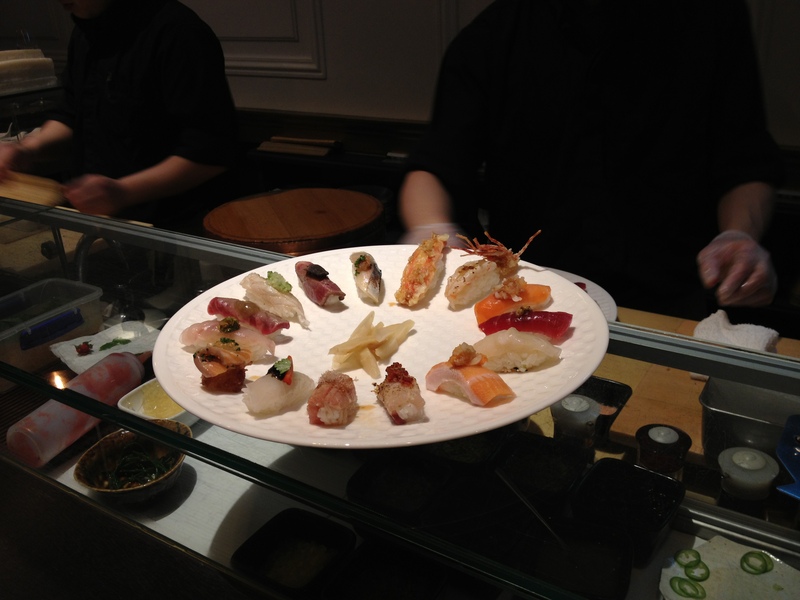 Price: High (high quality ingredient come at high price, especially when imported to London – the Omakase of 15 pieces costs £80, while 8 pieces come for £30). Can a Westerner imagine a sushi restaurant serving dishes without soy sauce? 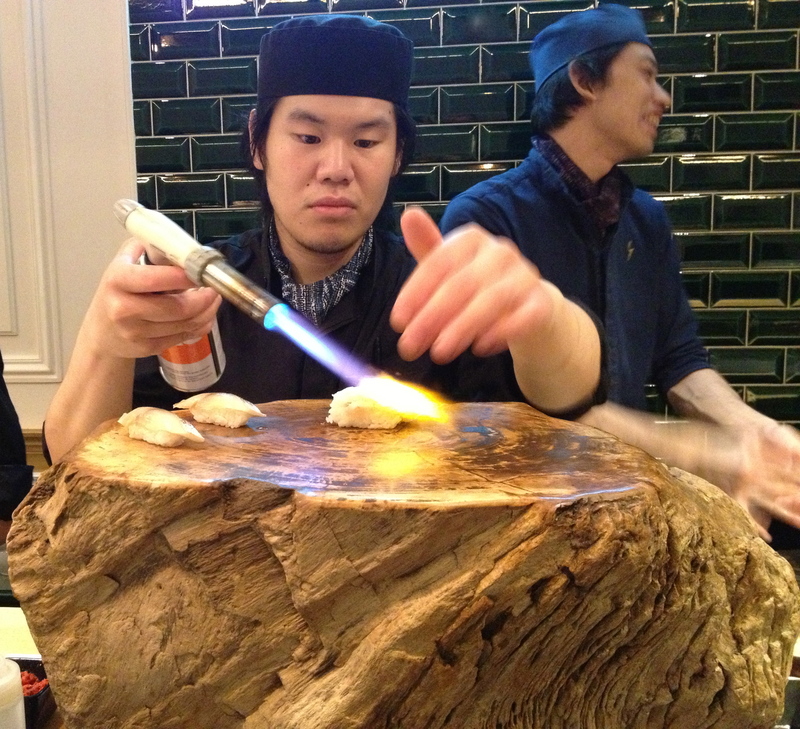 Hardly, but this is what they do at Yashin Sushi just off Kensington High Street, and they do it well. “But if you want to …” – as the neon banner on the wall behind the sushi counter says – you can order some. The reason for the chefs doing so is to show to their diners how all the Japanese ingredients you might know really taste without the overpowering sauce. Chef: There is a number of sushi chefs along the counter working on some impressive creations of food art. The head chefs though and also the co-founders are the ex-Nobu group chef Yasuhiro Mineno and the youthful Shinya Ikedo. 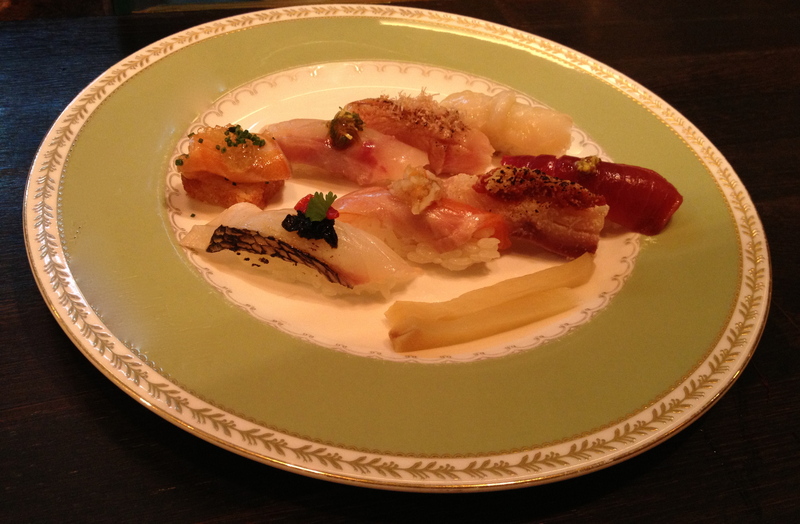 Their innovative approach to sushi and other Japanese meals sparks up the London’s dining scene. 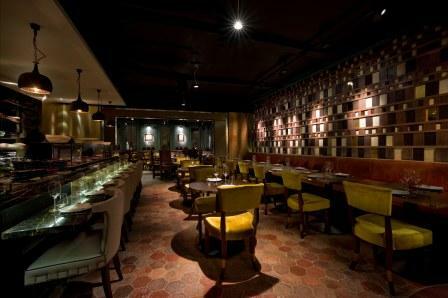 Atmosphere: Modern design, rabbit-shaped lamps, attentive service, long sushi bar and tall chairs. Yashin Sushi is a great spot to enjoy the omakase (chefs own creations of the best ingredients of the day served one after another). You can dress up or wear something casual, just leave the sneakers at home. Food: Edo-style natural flavours showing dishes. First you will be served a trio of original and tiny amuse-bouche, then you can start with the tofu foamy and warming miso soup and move to one of the cold dishes. The omakase though is really tempting. You can order from eight to 15 pieces, list all your allergies and then just enjoy the purity of the flavours. We did it after trying a number of cold and warm starters and did not leave too over-filled. 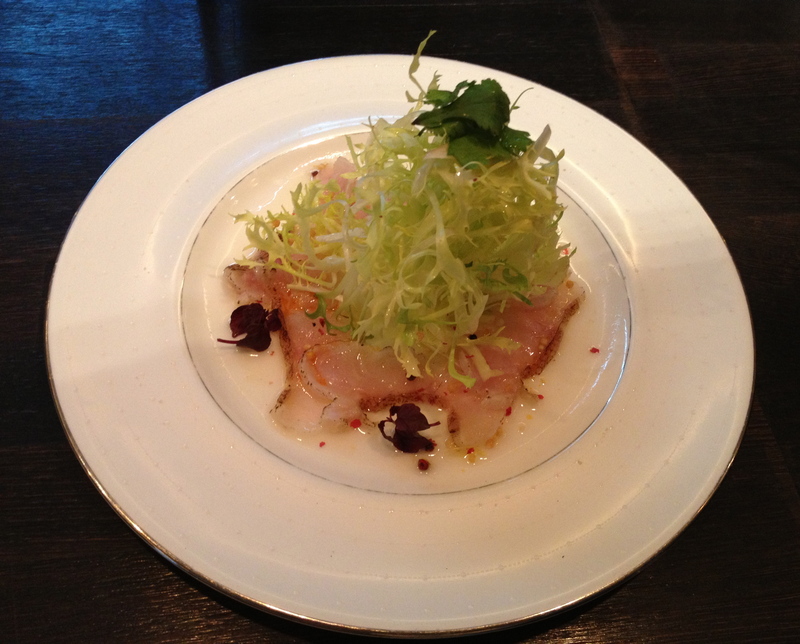 From the new style sashimi dishes the White Fish of the Day Carpaccio with crunchy lettuce on the top was refreshing and delicious. I would have the fish tartare with salmon eggs enriched by the creamy sauce and freshened up by a cover of chopped green chives and shiso again as it was a truly genial raw fish dish. The generous slices of Wagyu Beef Loin slightly seared around and served with savoury truffle jelly was outstanding. 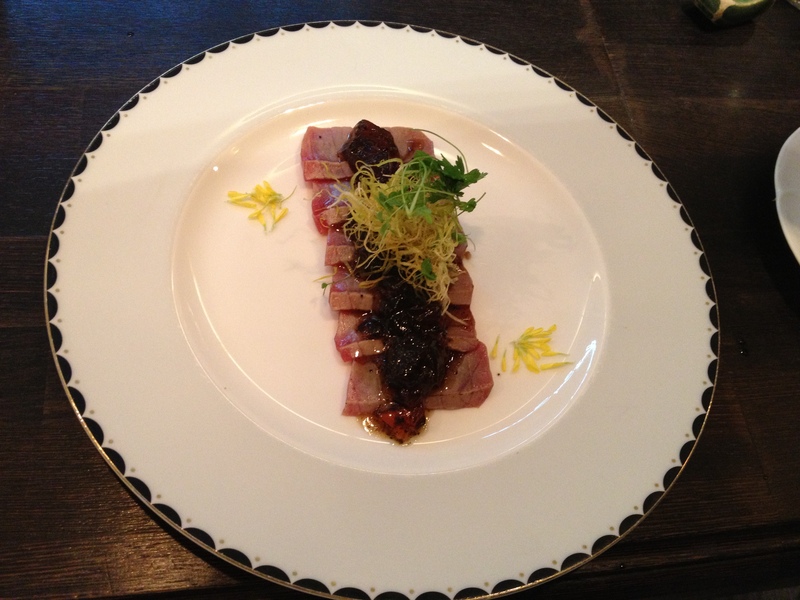 The fatty meat was succulent and was wonderfully elevated by the jelly-like truffle dressing. A sip or two or red wine cut through the fatness of this dish and refresh your palate ready for the next course. There are not many Maki rolls but they are nice and usually there is at least one vegetarian choice. 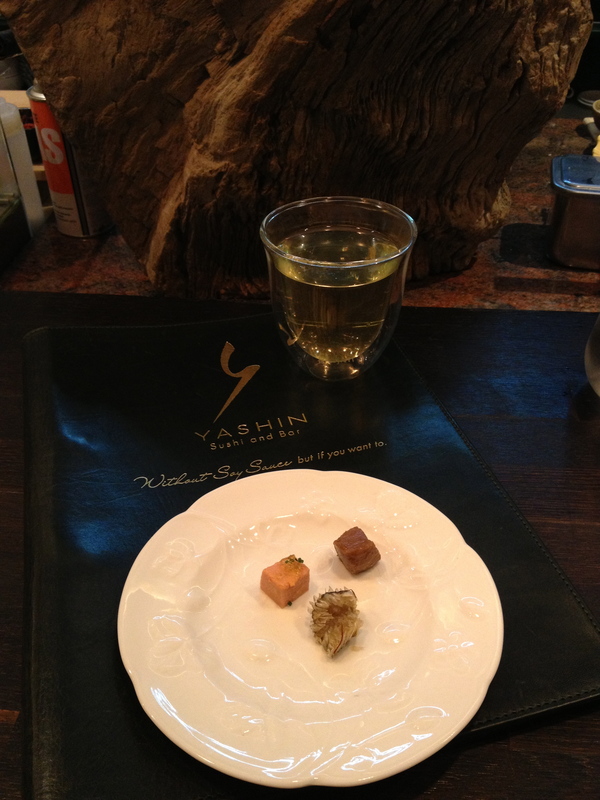 Look for seasonal dishes as I had amazing Seared mixed mushrooms when I dined at Yashin this month. Drinks: The wine list and sake list is good. Many of the wines are served by the glass, carafe and bottle. One of them is also the interesting Japanese pinkish Koshu from Grace vineyards. I love this wine for its freshness and delicate nature. Most of the wines are also organic or biodynamic. If you are not in the mood for alcohol, you can have the lovely green tea poured warm from a pot into your glass every time your it is empty. Soon a new Yashin in Knightsbridge is lined up to be open, so it will be interesting to see if they can keep up the same level of attentive service as in the original one in West Kensington. Address: 1 Argyll Rd, Royal Borough of Kensington and Chelsea, London W8, UK. Cuisine: Authentic French Bistro food. 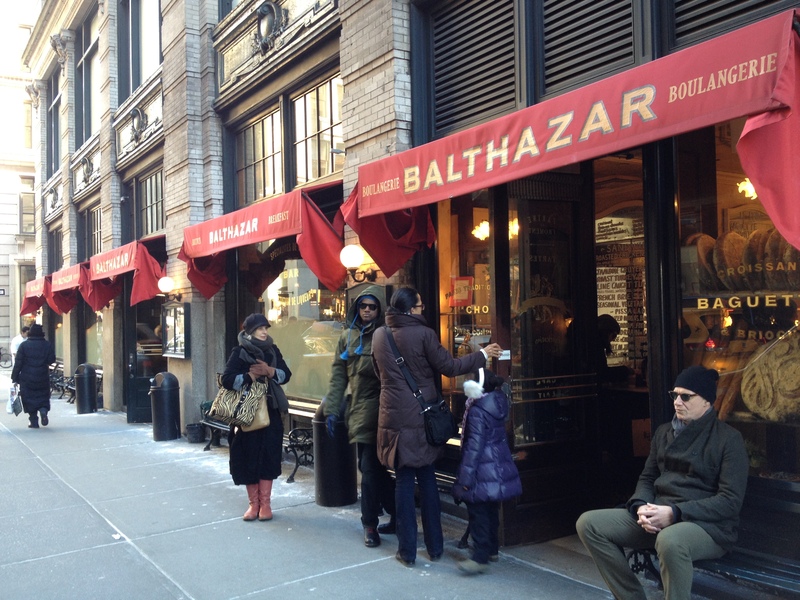 Opened by Keith McNally in the spring of 1997 Balthazar became legendary for its great bread and authentic brasserie-style cuisine that it soon attracted celebrities and the international as well as local power crowd. The bread success accumulated in to opening of the signature Balthazar Bakery next door. What is more, just this month McNally opened Balthazar in London’s Russell Street, so these of you having it far to New York, can savor its celebrity-approved tastes in the London Town. Of course there are plenty of excellent brasseries in Paris, a two-hour Eurostar train ride (London) or a an eight-hour flight (NY), yet now one does not need to spend hundreds of Pounds for a ticket and rather splurge it on a nice bottle of wine at Balthazar. 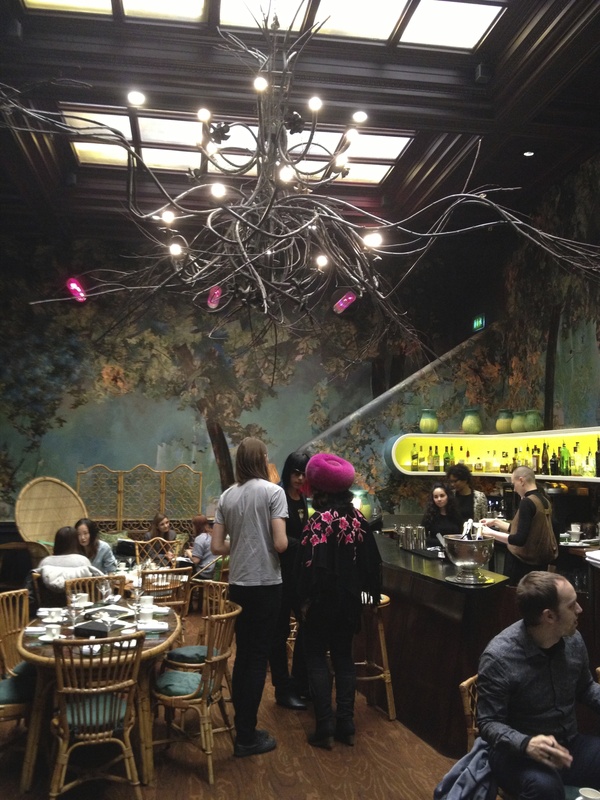 Atmosphere: The interior is authentic, you feel like at a Parisian brasserie. It is noisy, crowded and immensely popular. The latter due to the celebrity snaps entering, leaving or dining inside Balthazar in tabloid magazines. Reservations even for breakfast and lunch are highly recommended although if you are lucky and do not mind waiting you can get the same food at one of the small tables around the bar, where no reservations are taken. Surprisingly, despite the business the staff is fast and the food arrives promptly. Food: From Le Soupe à l’Oignon Gratinée to a juicy Filet de boeuf (steak), all the traditional French dishes are included. 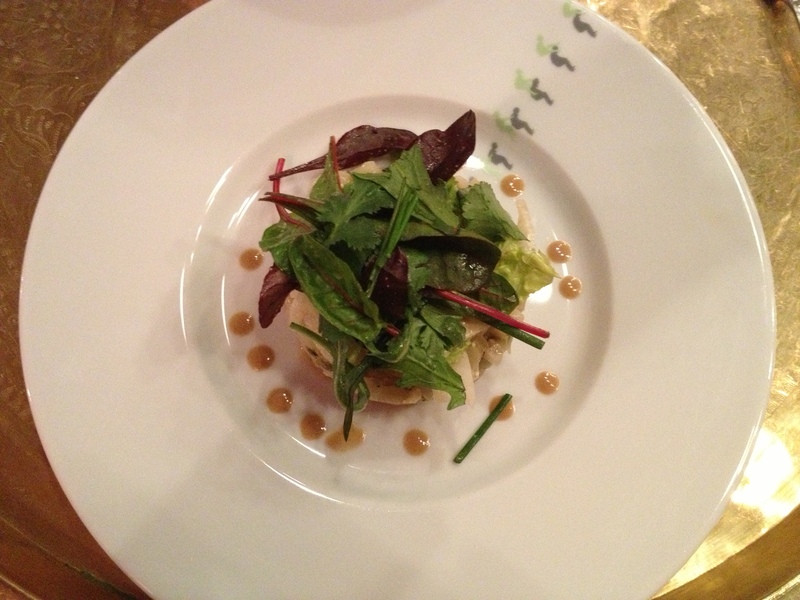 There is more though, with a bit of added creativity the chef took some French ingredients and modernized them a bit. 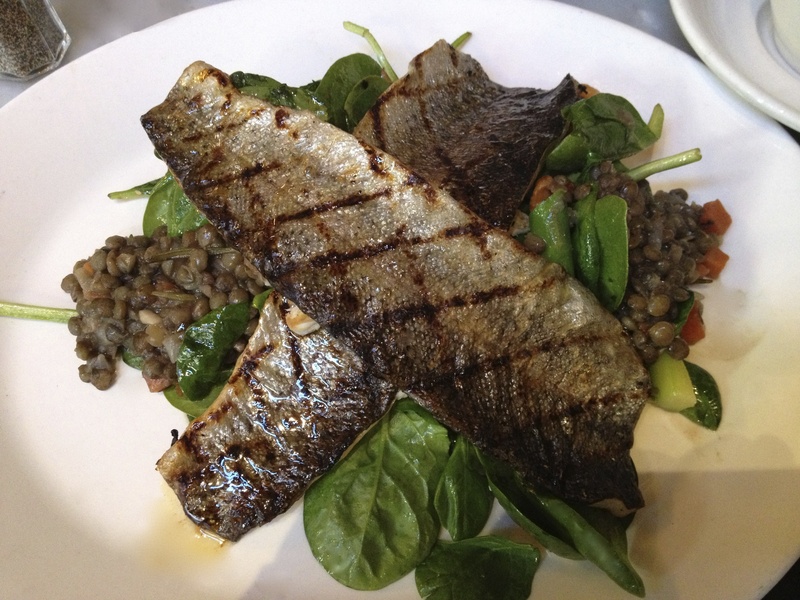 For example the delicious and filling Grilled Brook Trout over a warm spinach, walnut and lentil salad, that one can have as a main course for it is really big. The fish was fresh and delicate, the lentils added some freshness and protein-richness and the spinach leaves color and lightness. “C’est parfait avec une verre du vin blanc!“as the french would say. It is indeed ideal with a glass of white wine. A deeper full-bodied Burgundian Chardonnay or Pinot Gris from Alsace would do the job perfectly. The Seafood Ceviche in the starters is the answer to the fashionable Peruvian additions on the New York’s menus. 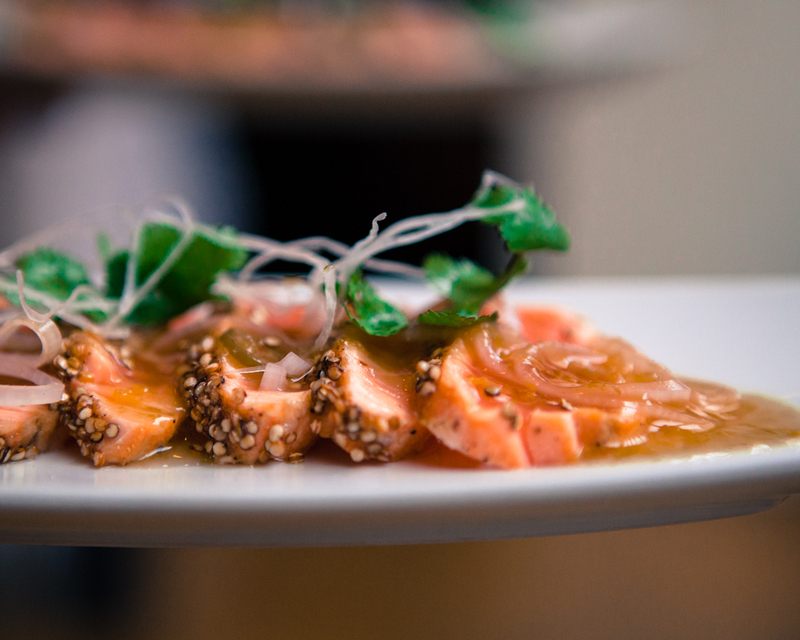 Raw seafood bar is more traditional brasserie fare and great to start with your bottle of champagne. From the main courses the most typical are the Moules Frites (Steamed Clams), the Steak Frites or the Duck Confit, and perhaps the most adventurous is BALTHAZAR Burger à Cheval. The Horse Meat Burger is a bit contagious to mention now when London is so predisposed with the faux-beef scandal. The british were outraged by the revelation that some of the beef imported from France turned to contain horse meat instead. Well, nobody died and if people enjoyed the taste, then what is the difference? If one is not totally a vegetarian then that seems to me to be quite irrelevant to distinguish which meat one eats (unless it is cannibalism – eating human meat is a unique category I would rather not got myself into). Back to normal, there are the “Plats du jour“, the Daily Suggestions that change throughout the week available for both lunch and dinner. The menus for lunch and dinner are the same, breakfast, afternoon, Sunday Brunch and After Hours menus are different. The desserts are baked on the premises and worth trying especially if you come during the afternoon for a cup of coffee or tea. Drinks: Wine, wine, wine … the list is excellent, with reasonably as well as highly priced wines, it is very French. What I like is that there are plenty of champagnes and wines-by-the-glass to choose from. Just ask the waiter which one he/she would suggest with your meal. I was satisfied with the mineral CHABLIS from Desvignes Ainé & Fils 2011. There are some half-bottles and well-priced wines so you do not have to go for a $200 bottle of Burgundy. From North to South each significant wine-making region is represented, so you might try something less-known, such as the old and uniquely tasting wines from the Jura. Mon-Fri: Breakfast: 7:30 am–11:30 am, Lunch: 12:00 pm–5:00 pm, Dinner: 6:00 pm–12:00 am (Fri till 1am). Sat: Breakfast&lunch: 8:00 am – 4:00 pm, Dinner: 6:00 pm – 1:00 am. Address: 80 Spring St, New York, NY 10012, USA.